A friend recently sent me a note pad holder with the coolest faux metal piece. I was so fascinated by it that I called her one night and asked her to explain the procedure to me which she did in detail. The next morning on the Stampin' Up! demo website was a tutorial for the same technique! It was fate! I had these little mini composition books made up for convention but they lacked something. I decided they needed a little faux metal treatment. 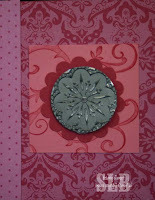 All supplies from Stampin' Up! I had so much fun with the faux metal technique! I will be doing a faux metal class soon! Sign me up. That looks cool. Sign me up. That looks really cool.